Summary : Like chocolate? Like mint? Then I have a tea for you. This superb tea from the Dragonwater Tea Company (now out of business) nicely combines chocolate and mint to produce a flavor that is remarkably similar to chocolate mint candies! This is a sweet-tooth lovers delight...in a tea. Review : And so the snow finally began. They've only been predicting it for the past few days...only to never show up. But finally...it is snowing here in the Biggest Little City in the World...also known as Reno, Nevada. With all the snow and cold weather...so un-Reno like in late February...I suddenly found myself in the mood for something with chocolate in it. And there, sitting on my cupboard, was a very enticing tea from the Dragonwater Tea Company (now out of business) called Chocolate Mint...a Rooibos Tea. Chocolate and mint...what a always pleasant combination. And so, I ripped open the top of this tea and gave it a try. This roobios tea contains the following ingredients : "Rooibos with chocolate pieces and peppermint leaves." Well...talk about an aromatic punch. Wow...a super strong aroma of chocolate! Always a good sign in a chocolate tea. And the aroma of the mint was awfully strong too. And mixed together...well...let's just say I forgot about the crappy weather we are having for a few moments in time. Now, let's talk about flavor. Do you really need to know? The tea has a wonderful flavor of both chocolate and mint! What else? Actually, the best way to describe the teas flavor is to use chocolate mint candy as an analogy. You know, those chocolate candy pieces that have green mint in them? Well...if you enjoy those candy pieces...it's a sure bet that you'll adore this tea...as it tastes remarkably similar to those chocolate mint candies. The after-taste of the tea is also superb. The tea has a nice, but not very strong flavor of both chocolate and mint that tends to linger around surprisingly long. When brewing this tea, one thing of note...let it brew for 8-10 minutes, as the flavor of the tea is stronger. Additionally, as the leaves are very small, be prepared to find some leaves that slip through the infuser during the brewing process. Overall...if you and chocolate and mint are an "item," I have no doubt you'll love this tea. Indeed...anyone who has a sweet-tooth is bound to like this tea...as it is a perfect cure for those who love chocolate but who want to avoid the heavy calories and tooth decay that goes with it! Recommendation : Absolutely. If you love chocolate, or mint...or better yet both combined...this tea has your name ALL OVER IT. This is a very tasty tea with a strong flavor of chocolate. And as it is a chocolate mint tea...it also makes a splendid after-dinner tea too. So if you like chocolate and mint...head on over to the Dragonwater Tea Company (now out of business) to pick some up...you won't regret it! Brewing Instructions : Use 1 teaspoon of leaves. Pour 6 ounces boiling water over the leaves. Let brew for 6-10 minutes. A brew time of 9 minutes was used for this review, as I prefer a stronger taste. 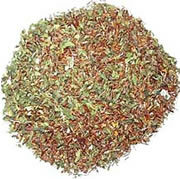 Mighty Leaf African Nectar Rooibos Tea : A very pleasant rooibos tea that has some nice tropical notes to its flavor. Culinary Teas Chai Rooibos Tea : A very enjoyable chai tea, one that has a great flavor but isn't too spicy.